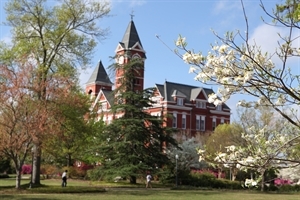 The unique character of the Auburn-Opelika area is the result of a combination of influences from the special atmospheres and energies provided by the diversity of communities in Auburn. This 85,000 square foot building will provide high quality, performance venues in support of music, theatre, dance, spoken word and other events. The main performance venue will house approximately 1,200 guests with full support (box office, catering kitchen, wardrobe and dressing rooms, and office spaces). The second performance venue is will accommodate up to 1,500 as an outdoor amphitheater. Coming August 2019. The tour began in 1993 with just a few homes participating, but has grown to include 60 homes on North 8th and 9th street. The homes are decorated with life size Santas, angels, toys, carousel horses and Christmas themed figures. The Victorian Front Porch Christmas Tour has been voted one of the southeast's top rated tourism events and featured in Better Homes and Gardens and Southern Living. The event is a self directed driving tour. However, on Saturday night North 8th and 9th streets will be closed to traffic to encourage visitors, neighbors and friends to stroll through the neighborhood. This enables everyone to leisurely enjoy the homes up close, listen to the carolers, and talk with residents dressed in Victorian costumes. This tour begins on North 8th street and 2nd Avenue and includes over ten city blocks. Admission to this spectacular production is free. Jan 33.6 F° 44.3 F° 55.0 F° 5.2 "
Feb 36.6 F° 48.2 F° 59.8 F° 5.2 "
Mar 43.4 F° 55.2 F° 67.0 F° 6.4 "
Apr 50.2 F° 62.1 F° 74.0 F° 4.3 "
Jun 66.6 F° 77.2 F° 87.8 F° 4.1 "
Jul 69.8 F° 79.9 F° 90.0 F° 5.6 "
Aug 68.8 F° 78.9 F° 89.0 F° 3.2 "
Sep 64.4 F° 74.6 F° 84.8 F° 3.7 "
Oct 53.2 F° 64.1 F° 75.0 F° 2.9 "
Nov 44.2 F° 55.2 F° 66.2 F° 4.4 "
Dec 36.4 F° 47.1 F° 57.8 F° 4.6 "
There are always fun and diverse volunteer opportunities in this area. Whether you spend time working with the Food Bank or Boys & Girls Club, or helping the Tourism Bureau with events, there's something for everyone. Volunteers are always need for large scale events such as Super 7 (the AHSAA Football Championships), Swimming & Dive events, AU campus events, etc.